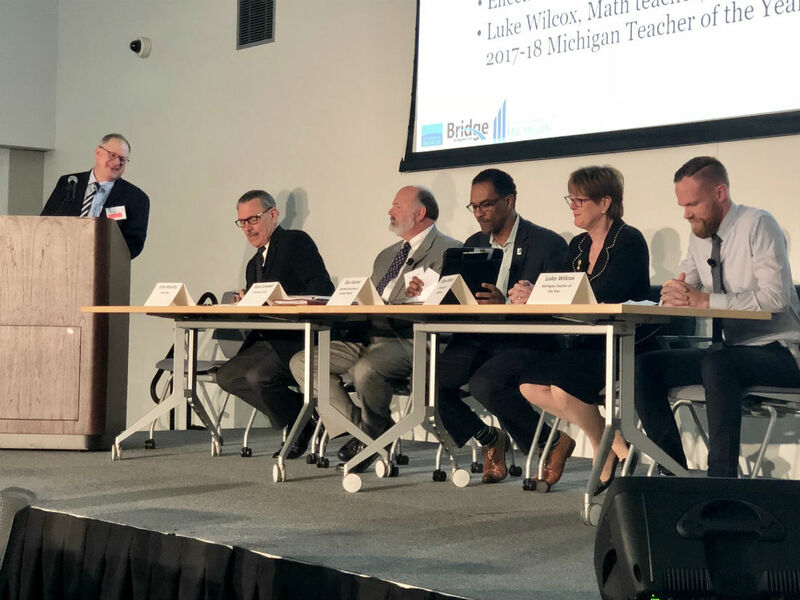 Hundreds of educators, community leaders and others gathered thursday for a Solution Summit on education in Detroit, sponsored by The Center for Michigan/Bridge Magazine and Business Leaders for Michigan. Panel on How and Why Other States Succeed While Michigan Fades. Marc Hill, Chief Policy Officer, Nashville Chamber of Commerce; David Mansouri, President, TennesseeSCORE; Jen Nelson, VP of Public Policy and Economic Development, Business Leaders of Michigan; Linda Noonan, Executive Director, Massachusetts Business Alliance for Education; and Paul Reville, Professor of Practice of Educational Policy, Harvard University. Panel on Key Education Issues for 2018 Statewide Elections and Beyond. Dave Campbell, Superintendent, Kalamazoo RESA; Jon Rakolta, Chairman and CEO, Walbridge; Dan Varner, CEO, Goodwill Industries of Greater Detroit; Eileen Weiser, Member State Board of Education; and Luke Wilcox, the 2017-18 Michigan Teacher of the Year from East Kentwood High School. 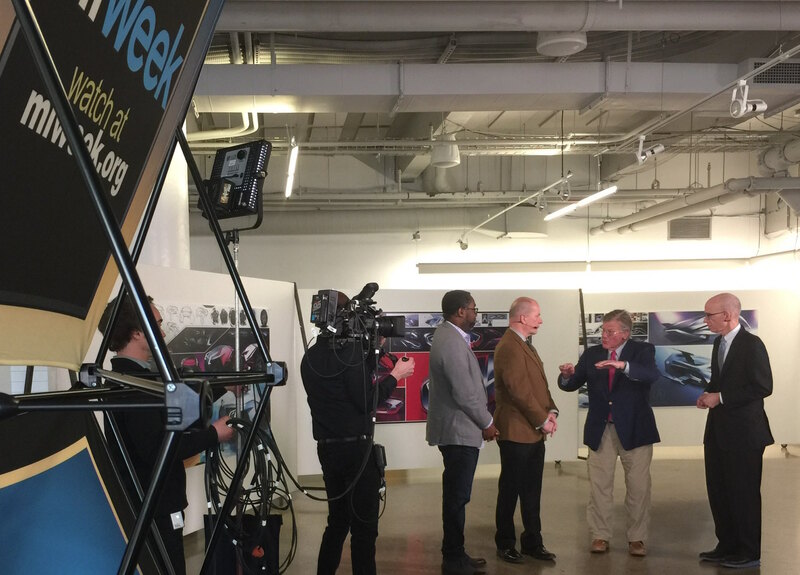 Stephen Henderson and Nolan Finley of MiWeek interview Phil Power, founder of The Center for Michigan, and Doug Rothwell, President and CEO of Business Leaders for Michigan. Both organizations hosted the Michigan Solutions Summit: An Educated Michigan. It’s no secret that when it comes to education achievement, Michigan students of all races and income levels are near the bottom of the pack, when compared with their peers in other states. Of equal concern, there appears to be no sense of urgency in Lansing to help solve the problem. 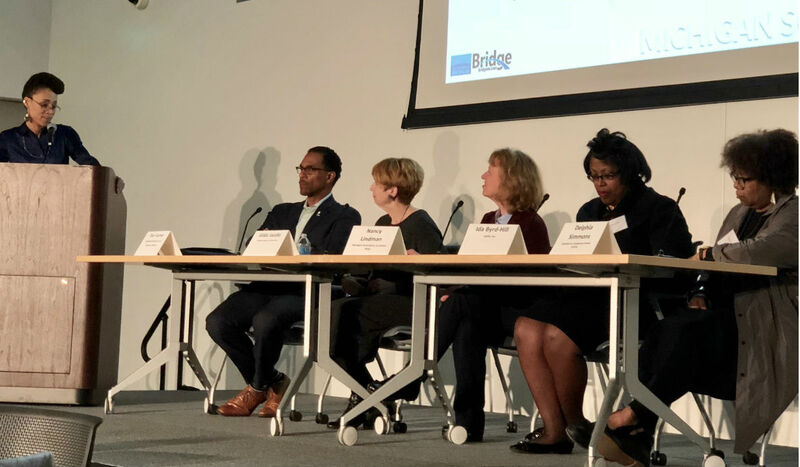 Prioritizing real education reform is the first, critical step to solving Michigan’s education crisis, experts from leading education states told a crowd gathered for a solution-based summit on education in Detroit on Thursday. Researchers shared damning statistics while educators lamented the dozens of disjointed improvement plans as well as a lack of political will that keeping the state’s schools from keeping up with other states. ​Co-sponsored by The Center for Michigan/Bridge Magazine and Business Leaders for Michigan, the summit brought to Detroit’s Center for Creative Studies education experts from Tennessee, one of the fastest growing education states, and Massachusetts, the gold standard for public education in the U.S. They ticked off a list of system changes Michigan can adopt to see the progress some other state’s are experiencing. Phil Power, founder of The Center for Michigan, called education the “number one problem” facing the state. “Today, Michigan is a bottom 10 state for educational outcomes,” noted Amber Arellano, executive director of the Education Trust-Midwest, a Royal Oak-based nonprofit. That’s true, she said, not just for poor and minority children, but for white and more affluent students, compared with their demographic peers around the country. Fortunately, Arellano said, Michigan is not without assets. Teacher pay, for instance, is number one in the nation, when adjusted for cost of living. Student funding levels are 24th, about average, and the state benefits from significant civic funding and participation. Several experts talked about the need for accountability, including a spirited debate over whether the governor should be allowed to appoint the state’s school board. Under the current system, board members are nominated by political parties and elected statewide. That brings an element of partisanship into policy discussions, and creates uncertainty about who will take leadership in redirecting Michigan’s public schools. “We need the buck to stop either with the governor’s office or the state board, but not both,” said one speaker, Doug Ross, co-founder of American Promise Schools, a nonprofit educational management organization. Ross said candidates for 2018 office in Michigan need to have a bipartisan plan for school improvement to secure an endorsement. That’s a sentiment echoed by several speakers, who called on political candidates this year for governor, House and Senate offices to go beyond campaign cliches about the value of education to articulate smart, evidence-based plans for turning around public schools. Luke Wilcox, Michigan’s current Teacher of the Year, said candidates for governor and 148 state legislature seats need to tell the public what they mean when they make bland statements of support for quality schools. “We need to figure out what that looks like,” he said. In Tennessee, education improvement is so central to state policy discussion that a candidate’s campaign can live or die based on their stance. Tennessee gubernatorial candidates took part in a campaign debate that focused solely on schools, said David Mansouri, president of Tennessee SCORE, a nonprofit and nonpartisan advocacy group. The state created an army of instructors that spread out across the state, training teachers on standards and expectations at every grade level. Several speakers said Michigan needs to create a common agenda with support from the business community alongside parents and teachers, one that’s not scattershot, but thoughtfully focused on two to three key improvements. Paul Reville, the Francis Keppel Professor of Practice of Educational Policy and Administration at Harvard University, co-founded the Massachusetts Business Alliance for Education. He said it was concern about prosperity and economic growth that first brought school reform to the forefront in Massachusetts more than two decades ago. The business community, he said, has the clout to get the attention of state policy makers. “It puts (education) on the agenda,” Reville said. John Rakolta, CEO of Walbridge and a member of the steering committee for the Coalition for the Future of Detroit Schoolchildren, said if Michigan doesn’t improve education the state’s businesses will have to increasingly import workers who have the skills businesses need, or export jobs. Chandra Madefferi, a vice president with the Michigan Education Association, the state’s largest teacher union, said it’s no surprise that undergrad enrollment in education programs at Michigan’s 15 public universities has fallen by a third since 2010. When she was a college student looking forward to a teaching career, she said she was encouraged to enter the classroom. Moje and Madefferi were joined on a panel focused on teachers, by Ralph Bland, CEO and founder of New Paradigm for Education, which operates charter schools in Detroit. The panelists argued that a climate of “scarcity” has trimmed teacher planning time and increased workloads, which has cut into the time that teachers, particularly young teachers, need to get better. This article to borrow from an old Aerosmith song is "the same old story, same old song and dance" we have heard over and over again. The political climate is so poisoned between the legislature and the teachers I don't see much chance for meaningful change. These people can come together and express their concerns but when they go their seperate ways so does any real interest in changing their positions or cooperating. How about all the "talking" heads start to listen to the people that do the work of education, the teachers and the students, the people we are failing. Listen, heed what they say and act to support the needs they articulate. If legislation, policy and regulation does not support LEARNING we are failing the future. Let go of compliance, conformance and one size fits all, not to mention the idiocy of standardized testing. "Getting past politics" would mean privatizing the schools. Are you sure that's what this is about? Certainly, I agree that candidates and office holders need to make education a priority and find. Way to turn talking points into collaborative and effective policy and action. One point that needs to be made is that we need to not only set a course leading to school improvement, but we also need to stay the course until we reach the destination or goal. With term limits we have been subjects to jerks and lurches and short sprints, but we never finish the race toward education excellence. Consistency and persistence and stamina will be needed along with compromise and collaboration if we ever hope to improve education outcomes. Let's study, for a change, what students in school such as St. Regis and in other affluent schools bring to the table and then try to copy. Without such an effort any attempts to "improve" are destined to fail. No one has surveyed by phone students than I have Over 18,000 surveys of 1,3,5,6, years after they left high school. You don't always get what you pay for but you have to give the necessary equipment, supplies,resources and money needed to do so. Love to hear your comments. R.L. I have never heard this before. What do you talk to these young people about, and how is it that you do this? What viewpoint do you represent? I have been the first manager many new-hire Engineers work with in the economy, or industry. Do you know what is the one question every one of these Engineers ask? I do. The owner of one company hired me to teach his senior level Engineers to work using the "80:20 Rule" where some employees work 16X faster than others. Maybe we should swap war stories? They only do the work when they have a desire to learn [“Bodily exercise, when compulsory, does no harm to the body; but knowledge which is acquired under compulsion obtains no hold on the mind.” Plato 428 – 348 B.C.]. If you look in any classroom you will see this proven every day. This article is about adults talking to other adult about how to spend other adults money, there is no well defined purpose, there is no talk about the role and responsibilities of the student in their learning, their is no talk of how individuals succeed in learning, their is no talk about what has been learned from successful students. None show any interest in even talking to the parents [other adults] of successful students to find out why and how those student succeed. The student is only an excuse to spend more money. In all the years Bridge has been 'reporting' on Michigan education they have not ask student how they succeed at learning, why they succeed at learning, what are the barriers they, individually, have had to overcome to succeed and how and why they did that. When reporters such as Ms. Dawsey and Mr. Wilkinson or Mr. French and Mr. Follet don't see the student important enough in the learning process to interview them and get their perspective, what hope is that that Center for Michigan or the 'education' professionals will have any interest in the students and what they have to say about their learning. If teachers want to be more generally respected, more of them should become good at doing their jobs and more honest about the situation when their administration is doing the wrong things for students. When half or more of the students in Michigan's schools are performing below grade level, we obviously have a crisis in competence within the educational system. If it isn't the teachers who aren't being effective, is it the administrators? Or is it the education professionals (including professors of education, teachers, and administrators) who created the grade level standards and assessments that measure how students are doing in relation to those standards? I agree that we've had too much churn in educational approaches here in Michigan, but Michigan's Department of Education and the licensed and experienced teachers selected by those professional education administrators were in charge of the MEAP exam and the corresponding grade level and curriculum standards from 1970 until we abandoned the MEAP for the M-STEP in 2014-15 school year. Michigan's students *improved* or held steady their performance on the MEAP for most of those years, while their SAT/ACT and NAEP scores (nationally-normed standardized tests) fell, as has been documented in the references in this article. Apparently Michigan's teachers and professional education administrators cannot be trusted to measure their own and their peers performance. Something similar happened when Michigan updated high school graduation requirements to what are supposed to be "globally competitive" standards. Students are now required to take 4 high school credits in each of Math and English, plus at least 3 high school credits in Science and Social Studies. Also required are 2 or more credits of a "world language", a half-credit each in physical education and health, a credit in a fine or performing art or music, and at least one on-line learning opportunity. Because so many Michigan school districts had delayed teaching Algebra 1 until high school under the old state standards, originally many, many students were failing to complete the minimum requirement of passing Algebra 1 & 2 plus Geometry. But due to simultaneous national and state pressure to increase high school graduation rates, far too many students were and still are allowed to fake their way through credit-recovery programs instead of actually learning much of anything. Average student academic performance fell faster and further during the period from 2012 to today, although the increased rigor and better alignment with national norms were supposedly designed to *improve* student academic performance. In almost 3/4 of the cases, when Michigan's recent high school graduates apply to enter post-secondary training or education programs, they are required to take remedial classes first, in spite of their 2.0 to 3.0 high school grade point averages. How is it possible to respect a profession that routinely lies to themselves and to their communities by graduating students who are illiterate and innumerate? Students who can't identify the three branches of either the state or federal government? Who can't decipher a bus schedule, a student loan application, or an apartment lease?